As I had purchased my 200NS pre-owned, I really wasn’t sure if the previous owner had ever replaced the coolant. When I adopted the Indian machine, she was over 2 years old. Back then, the odometer reflected approximately 24,000km of adventure. And since Bajaj’s manual calls for a coolant replacement every 30,000km or 2 years – whichever comes first, I figured that there will be a good chance that my mechanical steed is still carrying the same coolant that it was fed from the factory. 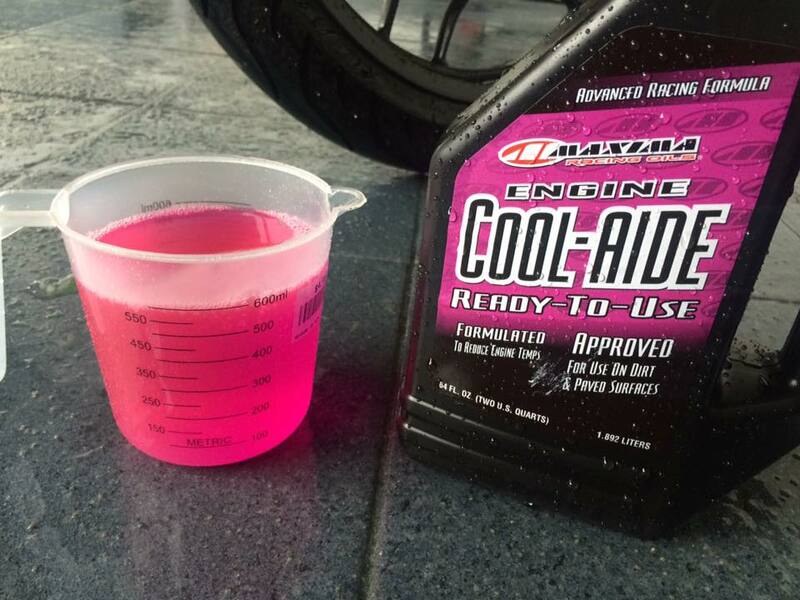 And so I did some research and narrowed my choices to one of these 3 coolants – Evan’s Waterless Coolant, Engine Ice and Maxima’s Cool-Aide. So, the cheapo in me decided on the least expensive in this list – the Cool-Aide. $18.50 for a 1.9L bottle from Mustafa Shopping Centre, this “performance coolant” is NOT anti-freeze. So this makes this liquid a little less popular in parts of the world where they experience winter. And since I figured it’ll be the apocalypse before Singapore ever experiences freezing temperatures, Maxima’s offering seem pretty suitable for our weather here. 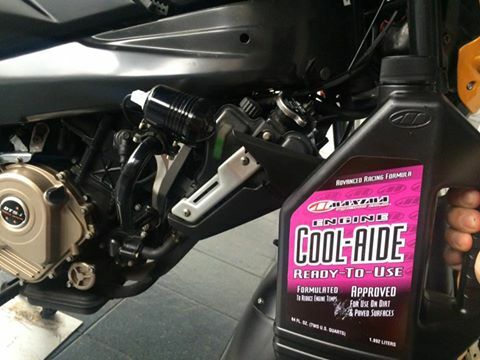 So off came the factory luminous-green coolant, and in it’s place Maxima’s purplish Cool-Aide. The owner’s manual calls for 1L of coolant during replacement. 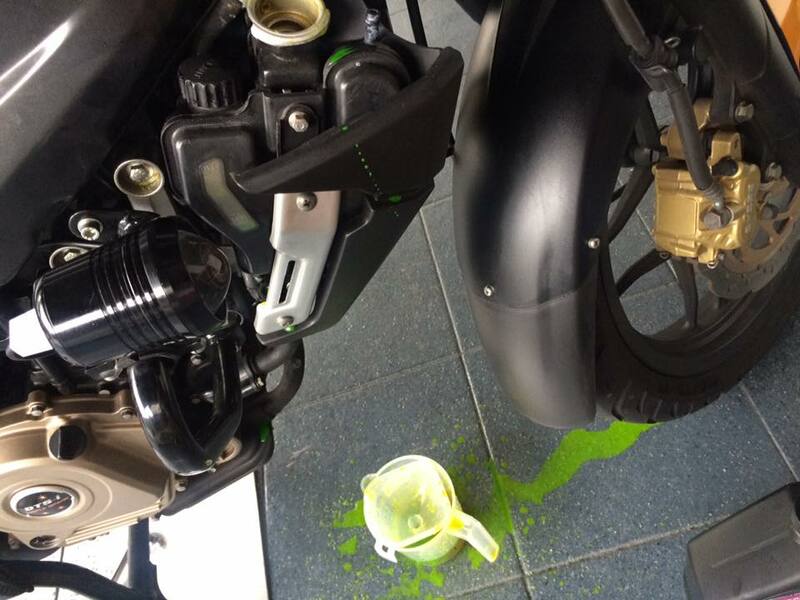 And so after draining the existing radioactive- looking liquid, I carefully measure 1L in my measuring jug and poured the new Cool-Aide into my thirsty bike. 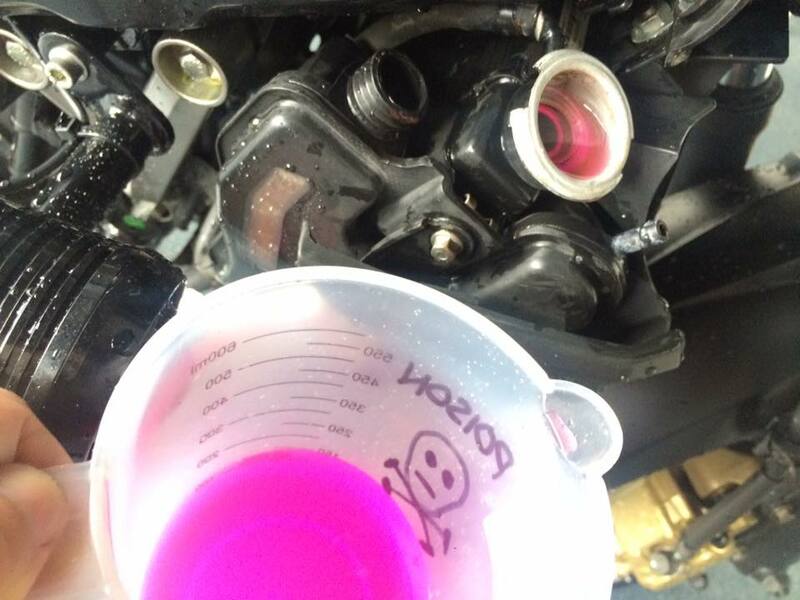 The radiator took in approximately 700ml or so, and the expansion tank another 200ml. Yes. You read it correct. Both radiator and expansion tank were already overflowing with 900ml of liquid in it. So I guess this 1.9L bottle is good for 2 fills. I’ll keep the rest of the grape juice for the coolant change next year. Haven’t rode it yet. The stock coolant was already doing a decently good job at keeping the triple-sparked engine cool. And since I have never experienced that “leg burning” event quite commonly reported by 200NS owners, I am not really expecting much, if any, improvements the Cool-Aide will bring. But hey, I’m replacing the coolant more as a preventive maintenance than seeking for “performance” here. I’ll report my experience here again after I’ve travelled some distance with this new juice. Measured for 1L of juice. Radiator’s full. Expansion tank full. Why is there still 100ml here?? !